At any rate, today's monster is a skeleton that requires bones to keep itself going, and it will go after anything and everything with a skeletal structure to fulfill that need. So, you could throw this in a tomb or graveyard, and it will have plenty of fodder beyond the PCs. I hope you enjoy the osteohulk, and I'll see you next week with another monster! This skeletal creature approximates a gigantic humanoid skeleton in appearance, but the bones composing it are from a variety of creatures. 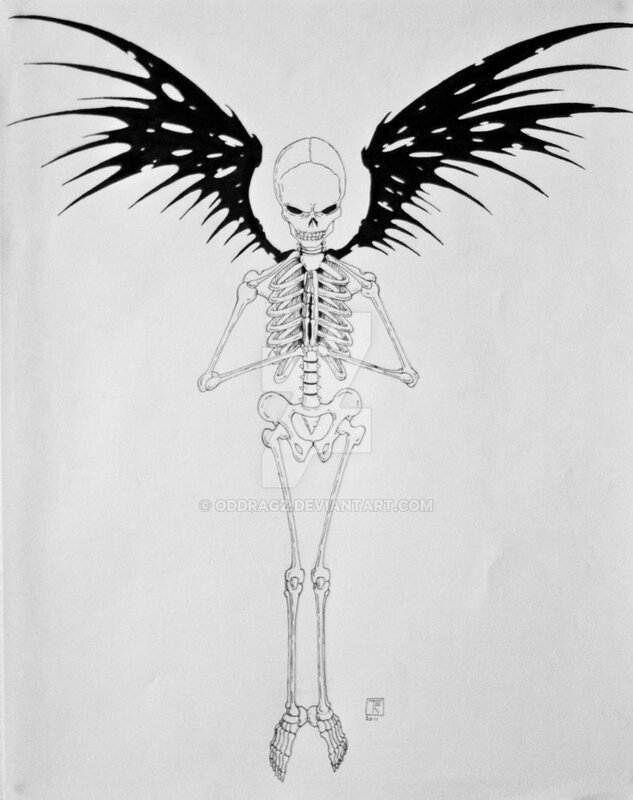 It has a pair of overlarge wings also fashioned from mismatched bones. Bone Extraction (Su) When an osteohulk strikes a creature with a skeleton, the target must attempt a DC 25 Fortitude save or lose parts of its skeletal structure. On a failed save, the target takes 1d4 points of Strength damage and 1d4 points of Dexterity damage, and, for each point of damage dealt, the osteohulk heals 5 hit points or gains 5 temporary hit points for 1 hour (up to a maximum number of temporary hit points equal to its full normal hit points). If the target rolls a natural 1 on its Fortitude save, the osteohulk heals 40 hit points or gains 40 temporary hit points, and the target loses the entirety of its skeleton and becomes immobile, reducing its Strength and Dexterity to 0; a creature made up only of bones (such as a skeleton) is destroyed. This ability also works on objects comprised of bone. Creatures that have taken damage from this ability cannot have the damage restored until they are the recipient of a regenerate spell or replace their lost bones through some other means. The save DC is Charisma-based. For every 50 temporary hit points an osteohulk possesses, it gains the giant creature simple template. The template stacks with itself (applying the template twice if the osteohulk has between 100 and 149 temporary hit points, and three times if the osteohulk has 150 or more temporary hit points). It loses an application of the template as its temporary hit points are reduced below each 50-point threshold. Breath Weapon (Su) When an osteohulk uses its breath weapon, it deals 12 points of damage to itself. Positive Energy Cage (Su) If an osteohulk succeeds at its Will save against spells or effects that deal positive energy damage, it takes no damage and stores the energy in a cavity within its body. It then takes 1 round to convert the energy to negative energy, after which it can release the energy as if it used channel energy with a cleric level equal to its Hit Dice (typically dealing 10d6 negative energy damage and requiring a DC 25 Will save for half damage). Osteohulks are the result of profane rituals performed over the site of a horrific battle or mass murder (sometimes carried out by the same creatures responsible for the ritual). The bones from the multivarious corpses knit together to create surprisingly mobile undead monsters which spring into existence craving more bone matter. Since they are less than subtle creatures, they usually act as cannon fodder for powerful undead generals. They act as the centerpiece of undead shock troops, otherwise made up of mindless undead providing a vanguard for the troop and fodder for the osteohulks, which sweep up the remnants into their masses, so they can become more powerful as they reach their enemies. Enterprising commanders place osteohulks with trolls and other regenerating creatures, so the undead hulks can increase their size without causing undue harm to the overall squad. When a typical osteohulk is encountered, it stands roughly 10 feet tall and weighs 800 pounds. Its size and weight fluctuate as it adds to its mass and loses bones during combat. Hello, and welcome to another edition of Frightful Fridays! This week gives you three monsters, all related, but distinct enough that you can use them without making reference to the others. If you want a low-CR scorpion, you're covered. If you want a swarm of scorpions (and who doesn't like swarms, besides many players), they're here. Finally, if you want a scorpion person who barfs out scorpion swarms, that's available too. I hope you enjoy the red banded scorpion in all its iterations. See you next week with another monster! This black scorpion has crimson bands encircling its body and its oversized pincers. Its stinger drips with liquid the color of blood. Attach (Ex) If a red banded scorpion is attached to a creature at the beginning of its turn, it gains a +4 circumstance bonus to attacks with its sting. Hive Mind (Ex) As long as there are at least two red banded scorpions within 60 feet of each other, if one scorpion is aware of a particular danger, they all are. No scorpion in a group is considered flanked or flat-footed unless all of them are. Red Banded Scorpion Poison (Ex) Poison—injury; save Fort DC 15; frequency 1/round for 6 rounds; effect 1d4 Str; cure 2 consecutive saves. Reflexive Sting (Ex) If a red banded scorpion is attached to a creature when it drops below 0 hit points, it makes a sting attack as an immediate action. Hundreds of scorpions from a wave of black and crimson. Grabby (Ex) A red banded scorpion swarm makes a free combat maneuver check when a creature leaves its space. It adds Dexterity modifier and a +1 size bonus to its base attack bonus when determining its combat maneuver bonus (giving the typical swarm a +10 CMB). If the combat maneuver check is successful, and for every 5 the check exceeds the target’s CMD, a scorpion remains attached. For each scorpion attached to a creature at the beginning of the swarm’s turn, the creature takes 1 point of bludgeoning damage and is subject to the swarm’s poison (the save DC is reduced by 2). Removing a scorpion requires a standard action, but a creature can remove any number of scorpions from itself or another creature within reach with a full-round action. Red Banded Scorpion Poison (Ex) Poison—injury; save Fort DC 16; frequency 1/round for 8 rounds; effect 1d6 Str; cure 2 consecutive saves. Reflexive Stings (Ex) All creatures in a red banded scorpion swarm’s space when it is reduced to 0 hit points take 1d6 points of damage from the swarm and are subject to the swarm’s poison. This giant humanoid has massive pincers and a tail arcing from its back over its head. Its skin ripples as if a multitude of creatures crawl just beneath the surface. Breath Weapon (Ex) A red banded scorpion shell can use its breath weapon, a cone of living scorpions, 3 times per day. When a creature takes damage from the shell’s breath weapon, it is affected by the shell’s poison. A creature that makes its initial Reflex save gains a +4 bonus on the Fortitude save against the poison. After a red banded scorpion shell uses its breath weapon, the scorpions form a red banded scorpion swarm anywhere within the cone’s area of effect. This swarm is under the shell’s control. 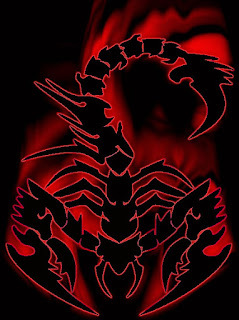 Death Is Not the End (Ex) If a red banded scorpion shell has not expended all its breath weapon uses for the day when it drops below 0 hit points, it dissolves into a number of red banded scorpion shells equal to the number of remaining uses. Hive Mind (Ex) As long as there is at least one red banded scorpion (including any within a living red banded scorpion shell) within 60 feet of a red banded scorpion shell, if any of the creatures are aware of a particular danger, they all are. No scorpion or scorpion shell in a group is considered flanked or flat-footed unless all of them are. Red Banded Scorpion Poison (Ex) Poison—injury; save Fort DC 22; frequency 1/round for 6 rounds; effect 2d4 Str; cure 3 consecutive saves. Red banded scorpions are one of the results of prayers by cultists worshipping heretical (or nearly forgotten) deities that desire to overrun the world with their vermin children. These cultists, in spite of many of their number belonging to humanoid species, believe humanoids don’t deserve the free reign they have over the world and seethe with anger when these so-called civilized beings crush vermin without a thought. One response to calls for the overthrow of these two-legged overlords was the creation of red banded scorpions. These creatures have a hive mind, a desire to gather in large numbers, and an urge to collect flesh from their humanoid victims. As the scorpions increase in population, they store the raw material they have gathered in a pool of their poison which preserves the material. Once they have enough flesh, they craft a humanoid body with the scorpion accoutrements of claws and stinger (requiring the sacrifice of dozens of their number). The scorpions then inhabit the body and their hive mind reaches an apotheosis, granting the gestalt superior intelligence. This shell then returns to lead the cultists who called upon it in the first place, or it infiltrates large cities to sow chaos. Shells tasked with infiltration often take class levels in sorcerer or bard to help with their disguises, allowing them to fit in with more cosmopolitan societies. A red banded scorpion is 1 foot long with a 2-foot long tail, and it weighs 8 pounds. A red banded scorpion shell stands 9 feet tall, has a 6-foot-long tail, and weighs 800 pounds. I hope you enjoy the bramblekin (at least before it dies at the hands/swords/spells of your PCs), and I'll see you next week with another monster! This stout, green bipedal creature has a friendly countenance, doglike ears, and expressive black eyes. Its most notable feature is the brambly bush sprouting from its back. Burrs (Ex) A bramblekin leaves burrs behind when it successfully strikes a foe with its slam attack. The target must succeed at a DC 13 Fortitude save or become sickened until the burrs are removed; the target takes a –1 penalty for each previous time the bramblekin used this ability. If the bramblekin attacked a creature larger than itself and exceeded the creature’s Armor Class by 2, the creature is treated as though it stepped on a caltrop, reducing its speed by half until the burrs are removed. Removing the burrs requires a success on a DC 13 Heal check, requiring a full-round action; failing the Heal check by less than 5 still removes the burrs but deals 1d2 points of damage. The save and check DCs are Constitution-based. Rustling Distraction (Su) A bramblekin can use its ventriloquism spell-like ability to create the sound of rustling bushes. As part of using ventriloquism, it can attempt a Bluff check to create a momentary distraction. The check is opposed by a Sense Motive or Knowledge (nature) check to determine whether the sound is real. Creatures that fail their checks are unable to make attacks of opportunity against the bramblekin until the end of its turn. Bramblekin serve as gardeners and horticulturists for the fey courts in the primal lands they inhabit. Despite their thorny appearance, they are gifted with green thumbs and take personal pride in the plots they tend, growing despondent when their plants wither and die, as is the natural course. If these bramblekin become overwrought with grief, their employers deploy them to the Prime Material Plane to accompany and protect dryads. They are also meant to gain perspective on the beauty they have available to them as contrasted by the state of plant life in the mundane world. Some bramblekin quickly learn the lesson and return home grateful to be away from the pale and lifeless imitations. However, many become fervent protectors of their new homes and attempt to recreate the glories of the plots from their previous homelands. In combat, most bramblekin lose any semblance of bravado and attempt to restrain and harry their opponents. When they become severely injured, they attempt to mimic nearby rustling brush to capture their opponents’ attention and slip away while they are preoccupied. More serious bramblekin take levels in druid or ranger to make themselves formidable. Bramblekin stand just over three feet tall, plus another half a foot to account for the bushes housed on their bodies, and they weigh 70 pounds. They have natural lifespans reaching 60 years. At the end of their time, they detach the bushes growing from their bodies, plant them, and expire, their rotting bodies providing nourishment for the plants. Three months later, several bramblekin emerge fully formed from the ground. Hello and welcome back to Frightful Fridays! The image below struck me as something I wanted to work on, and with the cold temperatures where I live, it was a reminder of spring (not too far off now). 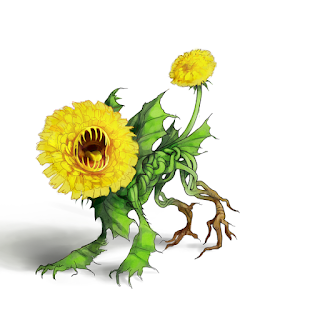 Of course, dandelions aren't the happiest harbinger of spring, especially for those who try to keep them off their lawns, but the idea of a persistent weed made for some fun monster design. I hope you enjoy the taraxacat, and I'll see you next week with another monster. This is a dandy of an illustration! This vibrant green plant has a bright yellow flower for a head, complete with toothy maw, and another for a tail. Dandy Lion Poison (Ex) Bite—injury; save Fort DC 15; frequency 1/round for 6 rounds; effect 1d3 Dex and victim must succeed at an additional DC 15 Fort save or become sickened for 1 round; cure 2 consecutive saves. Embedded (Ex) If a taraxacat stands on dirt or soil, it gains a +4 racial bonus to its CMD to resist bull rush, drag, grapple, and trip attempts. Regeneration (Ex) A taraxacat’s regeneration only works in dirt or soil. If the creature does not take acid and fire damage equal to its total hit points, it beings to regenerate 1 hour later. Reroot (Su) Once per day as an immediate action, if a taraxacat is on soil, it can teleport itself to another location within the same patch of ground (to a maximum of 600 feet away). This is a teleportation ability. Taraxacats, or dandy lions, are living dandelions and just as persistent as their immobile cousins. They can thrive in the worst conditions, provided they have a modicum of water and sunlight (occasionally supplemented by fresh meat), and are extraordinarily difficult to destroy. Many unfortunate souls have stopped taraxacat attacks and made sure the creatures were no longer moving only to have them spring back to full health minutes later and renew their attacks. Druids with plant affinities employ taraxacats as guardians but are careful to keep their numbers down to a minimum, since it takes little in the way of reproduction among the plant creatures to have them overrun their habitats. Paradoxically, when their yellow flowers give way to white seed-carrying florets, they are at their most vulnerable, becoming sluggish and more prone to harm from acid and fire, the only things that can truly eradicate them. When they are ready to go to seed, they find secluded locations where they can do so peacefully. As taraxacats age, they become larger and they learn to rake like their lion namesakes. They are also able to quickly grow smaller versions of themselves. Wild taraxacats rarely live to this advanced age and beyond, since the creatures they prey upon often torch the fields or woods where they and their progeny roam. Taraxacats measure 3 feet in length, stand 2 feet tall, and weigh 70 pounds. Elven druids and others who prefer the company of plants may opt to take a taraxacat as a plant companion. Starting Statistics: Size Small; Speed 30 ft., climb 10 ft.; AC +2 natural armor; Attack bite (1d6), 2 claws (1d4); Ability Scores Str 11, Dex 20, Con 15, Int 2, Wis 14, Cha 11; Special Attacks trip; Special Qualities low-light vision, regeneration. 4th-Level Advancement: Ability Scores: Str +4, Dex –2, Con +2; Special Attacks poison (Frequency 1 round , Effect 1d3 Dex damage and victim must succeed at an additional DC 15 Fort save or become sickened for 1 round, Cure 2 consecutive saves, Con-based DC); Special Qualities reroot.